Genuine OEM HP Toner Cartridge, Magenta, 2,000 page yield. HP part number: Q6003A, 124A Magenta. Color Laser Toner Cartridge compatible with HP LaserJet 1600, 2600, 2600n, 2605dn, CM1015, CM1017. Remanufactured HP Toner Cartridge, Magenta, 2,000 page yield. 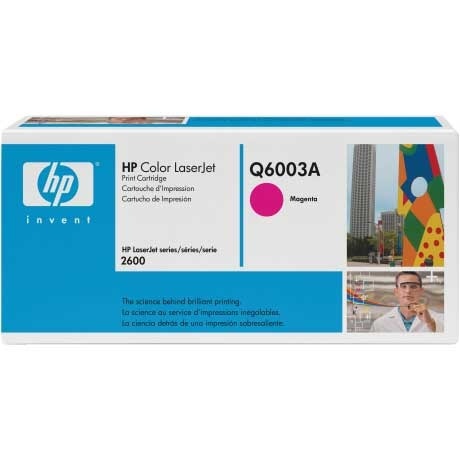 Replaces HP part number: Q6003A, 124A Magenta. Color Laser Toner Cartridge compatible with HP LaserJet 1600, 2600, 2600n, 2605dn, CM1015, CM1017. Remanufactured HP Toner Cartridge, Yellow, 2,000 page yield. Replaces HP part number: Q6002A, 124A Yellow. Color Laser Toner Cartridge compatible with HP LaserJet 1600, 2600, 2600n, 2605dn, CM1015, CM1017. This cartridge is most popular as the HP 2600 toner cartridge. However, in addition to fitting in the 2600 it also fits in many other printers.